The return from Shirdi: Kadamba Volvo! People staying in Bangalore would be quite aware of the word Kadamba - for a chain of hotels that operate at KSRTC/BMTC bus stations across Bangalore. For the bus enthusiasts, in the know, Kadamba is Goa's state run transport provider. Whats that got to do with my trip? A few days before my trip to Shirdi, a casual message on a WhatsApp group popped up with pics of a white swede with bold stickers reading Kadamba. Oh yeah! The swede I am talking about was a face-lifted Volvo B7R. 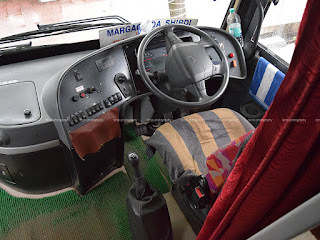 Those pictures led me to search more about Kadamba's Volvo service to Shirdi. I understood they operate a Shirdi-Pune-Margao service, that departs from Shirdi around 1430hrs. They had online reservation for end-to-end passengers and for passengers ex-Pune to Goa. I was always aware of the existence of this service, but never thought I could use them to ex-Shirdi. The pics were too inviting that I decided to take a plunge. After a heart-filling darshan at Sai Baba's samadhi, I headed back to my hotel room to pick-up my camera. I headed straight to the MSRTC bus station to look at back-up options. 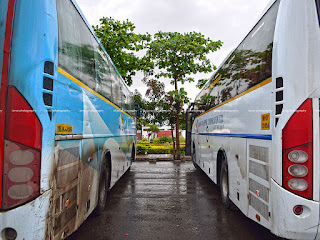 I really did not fancy changing buses at Ahmednagar - but I kept that was a back-up option. I also took a note of timings of the non-stop Ordinary buses that MSRTC operates to Pune. After this, I head out in search of Kadamba's parking location. I had an idea where they park, but I couldn't find the bus there. A quick search on RedBus told me the bus was yet to arrive (based on the scheduled arrival time). As I roamed around the area, I saw a white swede approaching the parking yard at a fairly good pace - yes, that was Kadamba's swede! I had a word with their crew to confirm their pick-up timing and place. I checked out of my room, headed to the restaurant for lunch and started my long walk to Kadamba's pick-up point, Hotel Holiday Park. On my way, I reconfirmed the availability of my Plan-B (the Pune non-stop bus). The bus was brought out of the parking lot exactly at 1400hrs. The bus, MH-07-C-9954, looked resplendent - the new face, the white colour, accentuated curves all add to the overall beauty of the beast. I am not sure if somebody noticed the irony. The bus is operated by the state transport undertaking of Goa, but bears a Maharashtra registration. The bus also operates on a Tourist permit. 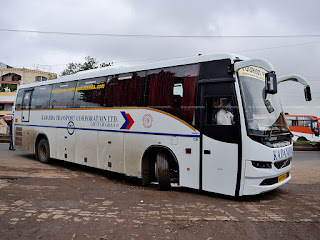 I was told the bus is owned by Konduskar, a prominent Maharashtra based travel operator, and operates on lease with Kadamba Transport Corporation Limited of Goa. 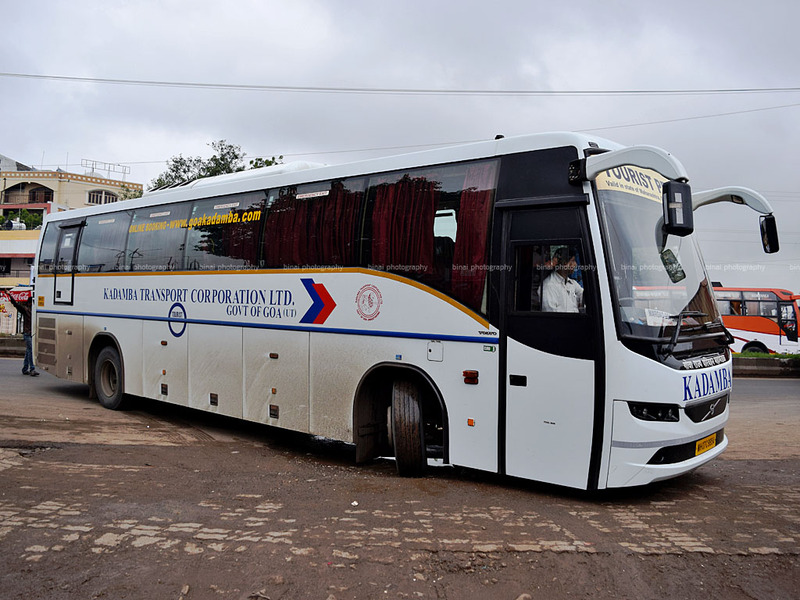 The bus - MH-07-C-9954, when it arrived from Goa. I had to wait for sometime, because, curiously, the bus doesn't have an onboard conductor! 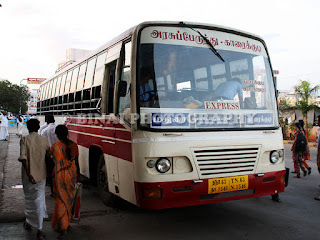 The bus had two drivers, who were the staff of the operator, and one person in Kadamba uniform - who acted as the conductor, but does not sell tickets on board. The tickets are sold by the travel agent who handles the bus out of Shirdi. I waited outside the bus for sometime - seeing me stand under the sun, the crew called me in, and let me take a seat inside till the agent comes. The engine was running and the AC was left on. The agent appeared about 5 minutes before departure - he collected the money from me, He checked the other seats and finally signalled departure. We started off from Shirdi at 1431hrs. The interior quality appeared a notch above the older variants. Unlike the B9Rs, there is no major improvement in the interiors (in appearance) - just the addition of the hazard hooter indicated this was a newer vehicle. The cabin had a lot of changes - the engine gear lever arrangement was changed, and the instrument panel was new. Roads were in terrible shape and we made quite slow progress for some time. The AC was in full flow. No movies were played - although there were stickers about a WiFi based entertainment system - but that didn't seem to work. The mobile charger points weren't switched on either. It began raining a little after we started from Shirdi. I dozed off for some time, en route. I woke up when we stopped at some place - we were at Tarakpur, and the time was 1619hrs. Less than two hours for this distance - despite bad roads. The halt was just momentary - enough for the crew to check if there were any pick-ups. We passed by Maliwada Swastik Bus Station around 1629hrs. Rain had taken a break then - it just began pouring down as the bus left Ahmednagar. The driver broke loose after Ahmednagar - picked pace in no time. I was quite impressed by his driving skills - he picks pace a little slow but maintains constant speeds. Gear shifts were soft and at the right rpm bands. He wasn't in for drag races, but maintained good pace, overall. It was still raining. We pulled into to Smilestone Motel for a break, at around 1654hrs. It was still raining - pulling out the umbrella was unavoidable this time. I had a very quick break, and was back at the bus capturing the beauty of the facelift Volvo 9400. I had a word with the driver - he claims the newer variants give better mileage and the gearing was more comfortable. He expressed some apprehensions about the body quality, though. We started off from there at 1720hrs. An MSRTC Shivneri was giving us company at the motel. The driver meant business soon after he was back on the highway. Speeds in the range of 90~95kmph was maintained most of the time. The bus seemed to have regular passengers - most of the passengers in the bus knew the crew. Speaking of passengers, we had hardly over 10 passengers on board the 45 seater bus. We reached Ranjangaon by around 1800hrs. Traffic build up began from here. The progress after Ranjangaon was painful - we spent most of the time standing still in traffic. The Kadamba, with a battered and bruised Shivneri.. The driver had bursts of speed everytime he had an opportunity - but the opportunities were far and few, though. I had a little bit of tension building up, since I did not end up missing my flight. I had lots of time to spare though - the flight was only at 2215hrs. I kept myself glued to GMaps to identify the location where I should be getting off the bus. I decided to get off at Viman Nagar and hire a vehicle from there to the airport. The driver ended up missing the bus stop (there was heavy traffic, and there was no way he could pull to the left for me) and dropped me a little after Viman Nagar at 1952hrs - 5 hours and 21 minutes after we started from Shirdi. Had not for the traffic after Ranjangaon, I am sure the bus would've dropped me at Viman Nagar well before 1900hrs. The bus, MH-07-C-9954, had clocked a little over 1.79lakh kms. The bus was clean inside out (outside only when departing - its impossible to keep them clean when it rains). The interiors were fresh. The crew were quite good - the drivers were not in uniform though. The driving was very good - keeping constant pace on the highway, no overspeeding or hard braking on the way. No waste of time either - they did not hawk for passengers, nor pick-up wayside passengers. I am still baffled why they do not sell tickets on board, though - this would increase the overall revenues. I am sure a lot of Shirdi-Pune passengers would prefer this bus if they picked up passengers at the bus station and sold tickets on board. Charging Point: Available, Not switched on. Will I take this service again? Its a great option to return from Shirdi. Absolutely Recommended! What is the meaning of the word "Kadamba"? Is it a Marathi word? 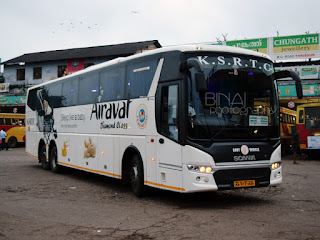 Way back in 2012 I had taken the Kadamba B7R from Bangalore to Goa. A no-nonsense value for money service, with fares which were much lower than the private operators and KSRTC then. Back to Bengaluru on Garib Rath! The AC Express to Kochuveli! Thrissur to Bangalore: Garuda King Class! 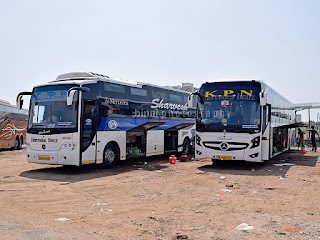 The Shivneri Scania & my trip to Shirdi!